With many facilities looking to increase sustainability and profitability, interest in LED lighting is soaring in the warehouse and logistics space. However, while the energy-saving benefits of LEDs are apparent, many facilities and estate managers are still wary of investing due to misconceptions about the nature of the technology. Here, we help anyone who is still confused by explaining the truth behind the five most common myths surrounding LED lighting for industrial spaces. Try not to look at the cost of an LED upgrade in direct comparison with an incandescent or fluorescent lighting solution. Think about the whole picture: the cost of the initial installation does not account for the Total Cost of Ownership (TCO), operations and maintenance of the system. LEDs consume far less energy, providing annual power savings of up to 70%, meaning that payback can be realised in a much shorter space of time. Not only are LEDs more energy-efficient than their incandescent or fluorescent counterparts, they are also a smart choice when faced with rising (or unpredictable) energy costs. It no longer makes sense to trade off the marginally shorter payback period of a traditional lighting system for a decade or so of higher energy bills. The long life of LED fixtures also massively reduces the costs associated with maintenance – and this ensures that investment in LED is ‘double win’ for any business. This myth may have persisted from the early stages of LED technology, when there was only a limited range of output available and many products were not bright enough for high-intensity applications. Today, a range of fixtures with varying degrees of lumen output are available for industrial customers to select the most appropriate system for their use. Many facilities managers have been used to evaluating the quality of light by ‘bulb wattage’, however it’s not accurate to make this calculation when dealing with LED fixtures. Instead, it’s better to think in terms of lighting efficacy. LEDs lose very little of their lumen output over the course of a 10-year lifespan and are better at targeting their light output at a specific task area – even in high-bay applications - compared with conventional light fixtures, making them ideal for warehouse and logistics spaces. The long life of LED technology has led some organisations to feel there isn’t much they can do to improve the energy-saving benefits of their fixtures. However, a growing range of smart, add-on control tools for LED systems can optimise usage, reduce energy consumption and minimise operative costs. The instant-on capability of LEDs means that timers and occupancy sensors can be used to turn the lights on only when the space is occupied. It’s also possible to network LEDs via remote management technologies, meaning that management of fixtures is possible at almost any location via a web-based interface. The HILUX HX LED range from Tamlite for example, has controls which are built into the luminaire, allowing full flexibility and ease of use. It’s unusual for a facility to make a decision to upgrade to LEDs purely based on environmental impact. Even when there is full awareness of the sustainability benefits, an upgrade still has to be cost-effective. With an LED upgrade, the reduction in CO2 emissions is only part of the benefit. The rest comes from the energy savings which add up to a significant return on investment. You can also add to this equation the savings made from eliminating disposal costs, and any costs arising from maintenance. LED technology has evolved rapidly over the last five years, leaving facilities managers hard-pressed to keep up with all the latest changes in the market. It’s often assumed that there is no difference between LED products and therefore it’s not worth investing more than you absolutely have to. However, many poor-quality LEDs have a Colour Rendering Index (CRI) of less than 80 which will only make certain colours look natural and not distorted. In spaces where people will be working for long periods of time, you need to opt for LEDs with a CRI of 85 – which is the minimum legal requirement - and colour temperature levels of 3500-4000 Kelvin. 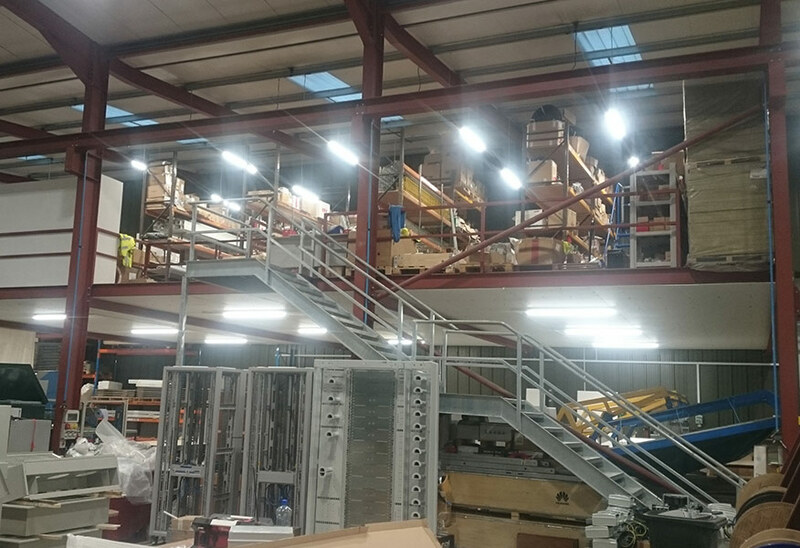 LEDs are proving their worth in industrial spaces time and time again by providing a sustainable way to save energy and minimise costs. The diversity of products in the market can be tricky to navigate, however if facilities managers look beyond the common LED misconceptions, they will be much more likely to find a system which is ideal for their space.